I recently met with a marketing executive from a luxury automotive brand who thought that since the average customer who buys his cars have a household income of $100,000-plus, Hispanics wouldn’t be able to afford them. When I asked him the cost of his lowest model, he said they started at $35,000. Guess what: Hispanics buy Toyota Avalons at $39,000, GMC trucks at $50,000, Lexus starting at $37,000. Regardless of what product or service some executives sell, some share a similar misunderstanding: They have no idea how dramatically the Hispanic community can impact their business. And by not embracing this community, they are limiting the longevity, growth and expansion of their businesses. 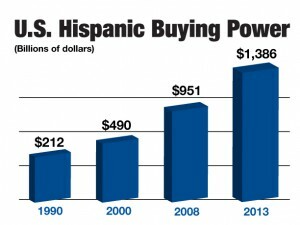 That’s because Hispanics are shaping the way of the new America. They have become an economic powerhouse with a purchasing power of $1.3 trillion in 2014 and will account for 10.6 percent of total U.S. buying power by 2019, according to the latest report from the Selig Center. The states with the largest Hispanic populations are California (14.5 million), Texas (10 million), Florida (4.5 million), New York (3.6 million) and Illinois (2.1 million), according to the Pew Research Center. Success within the Hispanic market goes beyond numbers. It goes beyond gross rating points, cost per thousand, size of radio station or circulation of the publication. It requires a deep understanding of their culture and behaviors. Analyze and understand the differences between markets and demographics. Meet with the media. Learn their weaknesses and strengths. Decisions can’t be made solely on rating books.This is the challenge many media planners face on a daily basis. Success within the Hispanic community requires the implementation of business strategies that actually address specific Hispanic needs. Until companies realize that marketing strategies are failing because American businesses expect Hispanics to adapt to their standards and practices instead of the other way around, success won’t be knocking on their doors anytime soon. Get to know Hispanics and you will be introduced to an amazing flow of new business. Hernan Tagliani, president of The Group Advertising, is a leading Hispanic communications expert, business speaker and author. His comprehensive understanding of the culture, diversities and values of the Hispanic market has helped him spearhead some of the most effective marketing, media, promotional and branding campaigns for well-known brands across the nation. One of the problems that businesses face is the desire to broaden their market without having any idea how to adapt to the needs of their new target audience. Although a lot of Hispanics cannot read, speak, or write English, their growing population and increasing business capabilities make them a prime clients. Translators and interpreters can help businesses reach to this type of market because professional interpreters and translators are well versed with both language and culture of Hispanics. This will make transactions with them easier, hassle free, and even twice as productive.